Blaster toys are available in more places than just the United States, so I've been perusing the latest issues of various toy magazines. Here's a few tidbits from the United Kingdom! We'll start with Toy World Magazine, which has advertisements for Petron Sports' Sureshot line of sucker products. In addition to the upgraded crossbow, Petron has a new, spring-powered sucker dart rifle. It's pump action, and while I imagine it's a dart pusher (as opposed to a plunger) launching the plastic dart, it could still be interesting to look at. 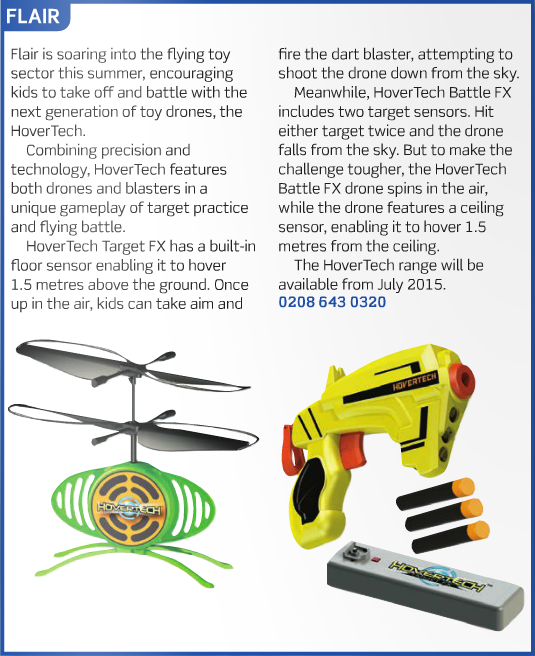 The March issue of Toy News (Issue 159), meanwhile, had articles showing off two electronic toys. The first one is HoverTech, which features targeting drones that can hover in place a certain distance from the ground or ceiling. I also came across this animated web banner while I was researching HoverTech. 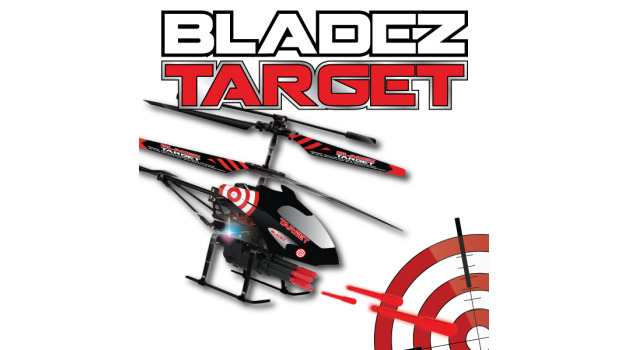 Finally, Bladez Toyz has an RC quadcopter, the Mycropodz Quad, that supports a wide variety of add-ons. Among those? A water blaster and a target missile launcher. Although clearly people are most interested in the bubble machine, obviously. 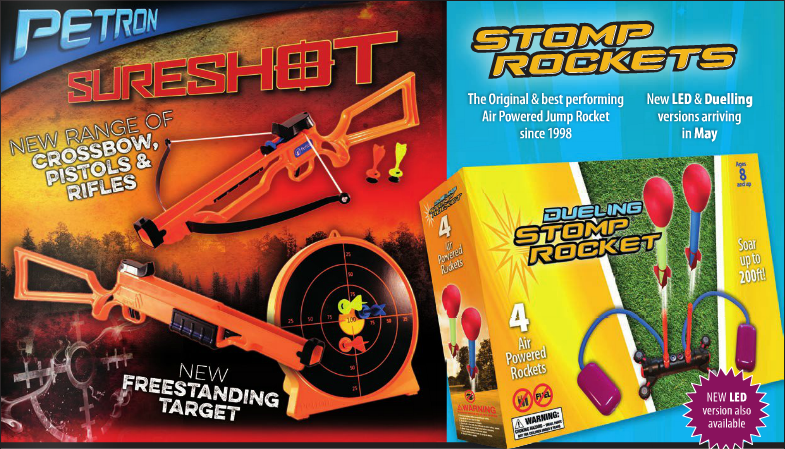 However, I doubt this uses actual darts, considering another RC product uses thin plastic "missiles". In any case, it's interesting to see new products from off the beaten path of Nerf, Buzz Bee, Xshot, and other common blaster brands! Kids Toys made by American companies having good standard therefore I like to purchase them for my kid. Henceforth, larger part of the Nerf items depend on froth. These incorporate weaponry and sports balls. Your blogs are Norwich to Peterborough easily accessible and quite enlightening so keep doing the amazing work guys.